A police spokesperson said, “Residents and businesses are advised to be vigilant for counterfeit Bermuda $50 notes currently in circulation, bearing serial number A/I 509979 and A/I 441162. 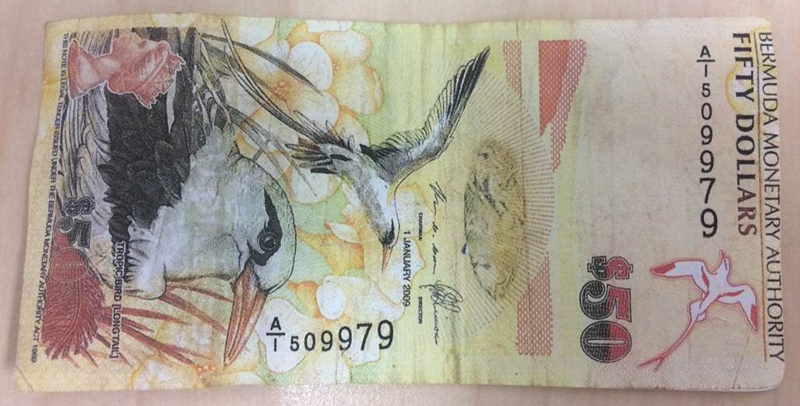 “This week alone – after the arrest of two men – police have seized 35 fake Bermuda $50 notes, which are easily identifiable by their low quality and having the ‘Longtail’ portrait on both sides of the note. “Additionally, each note is poorly cut and contains none of the official security features, such as the hibiscus watermark or metallic thread. “One man has already been dealt with in court regarding this counterfeit cash, while the other is currently on police bail pending further enquiries. “Employees are once again advised that if counterfeit cash is detected during a transaction, the member of staff receiving the fake money should hold on to it, note the description of the individual who tendered it and contact police immediately. “Similarly, members of the public should take a few seconds to examine any money they may receive, especially the larger denominations. “Persons who may have unknowingly received counterfeit currency are encouraged to contact the main police telephone number 295-0011 at the earliest opportunity to report the matter. “Alternatively, if you are aware of suspicious circumstances regarding suspected counterfeit currency and wish to report it anonymously, please call the independent and confidential Crime Stoppers hotline 800-8477. And one of the pair had his excuse (lie) already concocted as soon as he was searched. I wonder what kind of future lies ahead for him ? Don”t you all remember the last time the PLP got into power , how the crime rate went up ? Waiting for all you statisticians ………………………………………….